Learn about the Flir TG167 Spot Thermal Camera along with pricing, features, and frequently asked questions. The Flir TG167 Spot Thermal Camera is a thermal imaging camera that features Flir's Lepton micro thermal sensor allowing you to easily find unseen hot and cold spots inside homes and buildings. Provides image clarity on tiny details. Designed for the harshest environments. Pros: Easy to use, Flir Lepton micro thermal sensor allows you to see temperature as a thermal image, provides accurate readings. Cons: Low resolution, no WiFi or digital camera feature. Bottomline: Affordable, quality thermal imager for electricians, or anyone working in manufacturing, construction etc. The Flir TG167 Spot Thermal Camera retails for $379.99. What is the Flir TG167 Spot Thermal Camera's field of view? The Flir TG167 has a 25° field of view (FOV) providing exceptional image clarity on the tiniest details, including small connectors and wires. How can I transfer data and images with the Flir TG167 Spot Thermal Camera? You can easily save and store images and data for reporting on the Flir TG167, and download images fast via USB or a removable micro SD card. The camera comes with an 8GB Micro SD card and supports up to 32GB. Where can I buy the Flir TG167 Spot Thermal Camera? 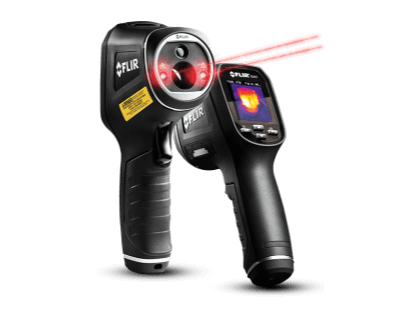 You can buy the Flir TG167 online from sites like Amazon, or directly from Flir.com. What are some Flir TG167 Spot Thermal Camera alternatives?